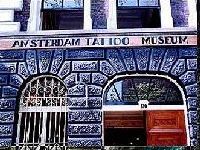 If you are looking for a place imbibing the whole tattoo world, the Amsterdam Tattoo museum, Netherlands, is just for you. Japanese hand tattooing tools, Maori objects, tattoo instruments from Thailand and exotic tattoo designs will make your trip unforgettable. Make sure to drop in, if you are a tattoo freak.